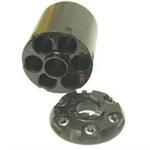 This is the "Pale Rider" style Conversion Cylinder Assembly, it will convert your 1858 Remington Uberti to .45 LC. Please click on the "Full Description" button for additional information and to read the "Caution" Statement provided by the manufacturer. This Brown Drop Loop Cartridge Belt, with 40 - .22 cal. cartridge loops is 2-1/2" wide and is cut from premium full grain saddle leather with border tooling. Measure at the hips where you will wear the belt; Medium,fits 43 to 47 inches. See "More Info"
This conversion cylinder will allow you to convert your 1858 Remington Uberti .36 cal. percussion revolver to a six (6) shot .38 caliber cartridge shooting firearm. For more information and to see quantity in stock, click the "More Info" button. Brown Belt, fits 31 to 36 inches, .38/.357 cal. loops, 40 cartridge loops, 2-1/2" belt is cut from premium full grain saddle leather, Border Tooled. Measure at the hips or where you will wear the belt. See "More Info" for sizing. This Brown Drop Loop Cartridge Belt, with 40 - .22 cal. cartridge loops is 2-1/2" wide and is cut from premium full grain saddle leather with border tooling. Measure at the hips where you will wear the belt; Medium,fits 34 to 38 inches. See "More Info"
Black Cavalry flap holster worn on left side for left hand cross draw. Fits up to .44 Cal. percussion revolvers with up to 8" barrels, flap has no embossing. 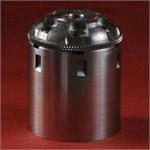 This Stainless Steel Conversion Cylinder will allow you to convert your 1858 Remington Pietta .44 cal. percussion revolver to a five shot .45 ACP cartridge shooting firearm. For more information and to see quantity in stock, click the "More Info" button.